The San Jose Blog: San Jose Native Comedian Phil Johnson Shooting 3rd Comedy Special at Art Boutiki! San Jose Native Comedian Phil Johnson Shooting 3rd Comedy Special at Art Boutiki! Phil Johnson is a comedian that was raised in San Jose and still lives nearby. This Saturday (Nov 8th) he'll be filming his 3rd comedy special at Art Boutiki at 44 Race Street. He tours nationally and has appeared at the Sundance Film Festival, Edinburgh Fringe Festival, and can be heard on Sirius/XM radio's Raw Dog comedy station. This guy is hilarious, so go check him out and support a local entertainer! Scroll down for more information and you can buy tickets over here. LOUISVILLE, KY, - San Jose native and national comedian Phil Johnson is bringing his hilarious antics back home for a special filming of his 3rd DVD. Johnson, who has appeared at the Sundance Film Festival, has an entertaining and action packed show filled with his two loves, comedy and music. The comedian and singer/songwriter will be performing at The Art Boutiki, 44 Race St, San Jose, CA on Saturday, November 8th at 8 PM. 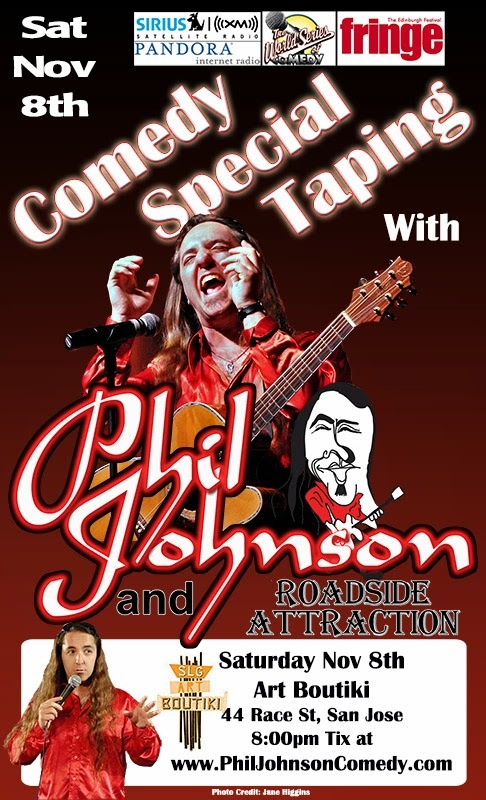 Advanced tickets for the “Comedy Special Taping with Phil Johnson” are on sale now for $10 per person or $15 for an advanced sale ticket including a DVD of Johnson’s performance. Tickets can be purchased online at http://bit.ly/philcomedyspecial. Tickets are $15 at the door. Comedy-goers can be part of the show and get their laughs with Johnson’s original music and stand up comedy. His playful and good-humored songs are inspired by the oddities of everyday life, social issues and the flat out crazy things people do. Johnson has performed at the Sundance Film Festival, Edinburgh Fringe Festival, Sirius and XM radio comedy station Raw Dog. He has multiple DVDs and CDs with his clever sidesplitting comedy available for purchase. Johnson grew up in the Berryessa area of San Jose and now calls Milpitas home. More information on Phil Johnson can be found on his website: www.PhilJohnsonComedy.com.